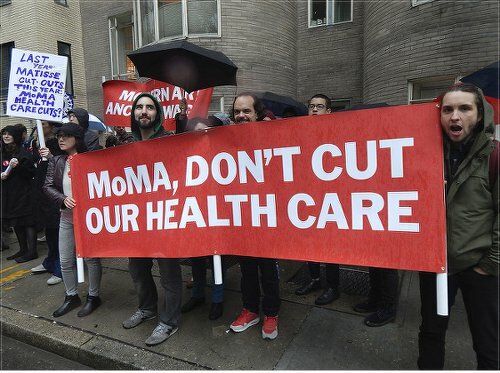 It was pouring on June 3 outside a garden party thrown for the wealthy contributors to the privately funded Museum of Modern Art in midtown Manhattan, but the rain couldn’t dampen the shouts of 150 MoMA workers fighting to prevent cuts to their benefits. It was the first such union protest since United Auto Workers Local 2110 held a prolonged strike there in 2000. Chanting “MoMA says cut back, we say fight back!” “Modern art, ancient wages!” and “Share the wealth, protect our health,” the demonstrators distributed a statement to the public, which read: “We are the Museum of Modern Art’s curators, educators, visitor assistants, registrars, librarians, researchers, designers, photographers, editors, conservators, accountants, and more. We love our work and are proud…. “We’re here tonight because MoMA management is demanding deep cuts to our health care coverage. Some of us make as little as $29,000 a year … most of us earn less than $50,000. Without a secure benefits package, we cannot make ends meet in New York City. “Please urge the museum to offer us a fair contract. … #WeAreMoMA.” Though the contract expired on May 20, negotiations were extended until June 20. (Huffington Post, June 6) For the latest information on the strike, visit UAW Local 2110 on Facebook.